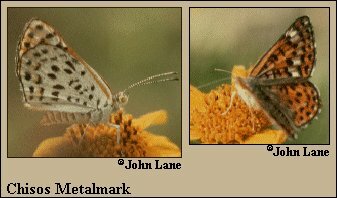 Identification: Similar to Nais Metalmark, but underside of hindwing has complete submarginal row of distinct black spots and arrowhead-like dashes. Wing Span: 1 1/16 - 1 1/4 inches (2.7 - 3.2 cm). Flight: May to August (2 flights). Caterpillar Hosts: Havard\'s Plum (Prunus havardii). Habitat: Slopes and ridges in Chihuahuan woodland. Range: Known openly from a few localities in west Texas including Chisos Mountains in Big Bend National Park. Conservation: Population in Big Bend National Park (subspecies chisosensis) should be monitored and conserved. Surveys for other populations in west Texas and neighboring Mexico are recommended. NCGR: G1 - critically imperiled because of extreme rarity (5 or fewer occurrences, or very few remaining individuals).